This is a group for ship scratchbuilding questions, topics and projects. Some time ago, I found a Revel P6M Seamaster kit, the oldest, and after figuring out its scale, 1/136, I began researching a bit, and found, along my way, a copy of "Attack From the Sea, A history of the US Navy's Seaplane Striking Force". At the beginning, I'd wanted to scratch build the tow dolly, and had been making plans(actually drawing plans), until I got this book, and found inside the proposed tenders, LSDs. Now, I'm not very sure as to the exact size of an LSD, but even at 1/136, it'd still be huge, so I've been kicking around the idea of modelling part of the ship, either the ramp, or, if I want to portray the model in the process of possible maintenance or refueling and re-arming. However, as I've been wondering about this, I started trying to research the ship, and haven't had much luck, so I'm asking if anyone has any helpful suggestions. I'd like to do this as a whif, or what if, with the Seamaster as a deployed weapon system, and after I can get more information on the ship, I could then consider a possible squadron, although I doubt that just tacking on the markings of an extant squadron would quite cut it, because something like this cries out for at least one Sea Dart deployed along with it, which would be a bit of fun, as while there are Sea Dart models available in 1/72, there are none in 1/136, so another scratching would be in order. Of course, part of that could be avoided if I took a page from the Japanese and have a small island, much like the F1Ms were deployed, kind of a forward base. The reason for the title is simple: I never had anything to do with modelling a ship, which might open new doors for me. Max take a look at THIS site it has quite a bit of information on the aircraft and the plans for it's use including photos and drawings. 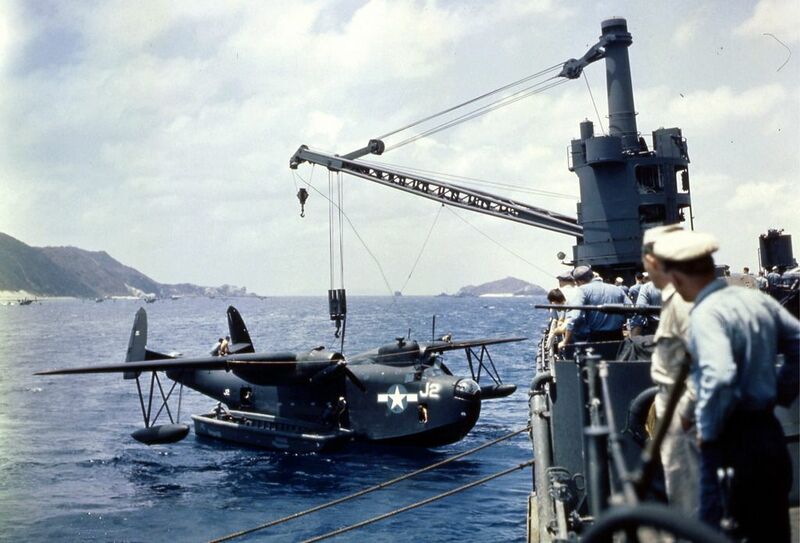 Included about a 3rd of the way down is a photo of the USS Albermarle (AV-5) which had already been converted for the roll of tender for the P6M. There is also some concept artwork for a catamaran tender which allowed two of these beasts to be maintained inside the catamaran along with concept artwork for a modified LSD. There was also the USS Ashland, LSD-1, 5the USS Thomaston LSD-28, among others(I went to the wikipedia page for the USS Ashland, which photos are in "Attack From the Sea". I'm still wondering if a complete model ship at 1/136 scale'd be doable. Huge(I think they were well over 400 feet long), but doable. And now I have a squadron, VP56, mentioned on the site, as well as a possible 3rd ship, the USS Ablemarle AV-5. if the scale is 1/136. You would need a large display case, at least 4 ft long. 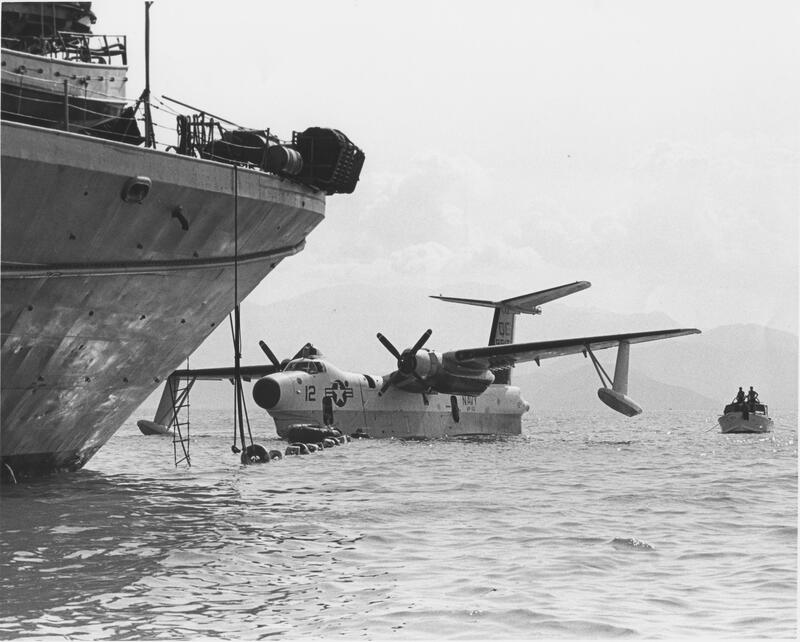 One option could be to show the aircraft moored alongside the ship and the "ship" part would be a section of the side of the ship, long enough to go from edge to edge of the diorama. Think of it as sitting in a boat taking a photo of the aircraft, making it fit into the picture with just a little background on each edge. Some water in front, bit of ship to the left, right and above, maybe just above the railings. Another, less complicated option could be a meeting at sea between a smaller ship (patrol boat, radar picket, submarine, USS Asheville??) and a Seamaster. A ships boat or inflatable rubber dinghy would be in the middle doing the transfer of goods or personnel. An agent being flown out to a submarine and the submarine would then continue with the mission of clandestine insertion of the agent on the coast of a hostile country? A third option is just the Seamaster and the ships boat/boats, the ship (whatever it is) would be just outside the diorama. IF the Seamaster is moored near a ship then a boat could be bringing the crew to the aircraft. Ok, not quite as huge as I though, with a 46.53 inch and a beam of 6.11. I've seen ship models, with scales being 1/700 and 1/350, with smaller ones 1/72. But as the LSDs are not smaller boats, I'd assumed that it would've been a bit on the ridiculous side, size-wise. But a bit under 4 feet feels better. Still large(1`/72 Spruce Goose large), and a real space eater(shades of Lovecraft). Still, perhaps a diorama with the Seamaster being hauled(or using a modified powered dolly) up the weather deck ramp, and that'd be about it(just part of the ship, not the whole beast, although an LSD model is taking on a fascination for me). Still, never having built a ship model, I do have my work cut out for me. Sometimes I wish I had another hobby, one more suited to where I live, like making a mobile test cell(basically a pickup truck with an engine mount in the bed, along with a Kidde fire extinguisher, engine controls, and a couple tanks, one 15 gallon for gas, and a 1 1/2 gallon for oil, and a beyond TBO radial that can't be used for flight anymore, say a 1340, 985, or an 1820 with test club to make lots and lots of noise here. Help wake up the neighbors, especially when it's warmed up and idling pretty good, then firewall it, pull full lean, and with a 2 meter tongue of blue flame, and really roaring. You might take the A&P away from the air field, but you can't take singing engine out of the A&P. Used to work at a repair station for radials, and that was our test cell, an old pickup with engine mount in the bed. One time, an engine had coughed just before it started, and having been primed with more fuel than normal, burped the gas all over the front of the engine, didn't catch, so the boss used the primer again, it caught, with a bit of flame, which caught the gas it had puked earlier, with the expected fire ball, After that was put out, the boss decided to change the name of the company from Firewall Forward to Fireball Forward. Lot of fun with that 1820, and boy, were we happy to see that one go. I love the bottom photo. I'm thinking of that. I want to thank you for the pics; they are giving me more meat on the bone to chew on. And now, given my warped thinking, I'm wondering what this'd look like in 1/72 or even 1/48, which would mean that not only would the Space Eater be a real Lovecraftian tale(tentative title being "The Thing That Took Over the Display Case". You'll have to pardon the Lovecraft references, but his works provide fascinating fodder for an inveterate smartass such as myself), but non-stop scratch building, and a crying need for new medication(or go to the therapist and get my head examined. If you decide to go for the 1/72 option there is a 1/72 scale submarine that could be useful. Revell 05119 USS Skipjack, I think it might be same plastic released by Moebius. Commissioned in 1959, shakedown cruise in August. The Seamaster program was cancelled in August 1959 so theoretically they could have met on the high seas. You really do know how to put out a fire, doncha? Especially when a dozen liters of gasoline are used for the suppression of the flames. A 1/72 Seamaster really would be the way to go, although I could argue that 1/48 or 1/32 are nicer for detail(where the Devil lives), but while a 1/72 Seamaster is a nice size model(nice=huge), a 1/48 Seamaster would be ridiculous, and a 1/32 version would be ludicrous, and both appeal immensely to me. P'raps that shows that I harbor a secret streak of masochism, but I've always felt the larger scales are easier to build(less need for those interesting elder appliances, eye glasses), and they do lend themselves to better scale detail(better to avoid very squinty eyes that way), I have the Revell kit, and being 1/136, I'll stick with that for the nonce. And on the subject of the Seamaster itself, I'd like to indulge in a bit of speculation. Had it become a reasonably good weapon system, and turned out to be very reliable(think B52), how much of a stretch would it be to contemplate this beastie participating in the Vietnam conflict? Yes, it originally had J75s, but what if it lasted long enough to be re-engined with something a tad more up to date with a J79? Or a British equivalent engine? And with that in mind, since the Navy ended up being satisfied with it(to the tune of some 500-700 examples built), what about export versions, and possibly even a pirated Soviet copy(a really updated Be-10 perhaps?). And since I'm in a speculative mood, what might have happened had Martin dusted off the paperwork on the XB-51, and, with what they learned from the P6M, updated it. I always felt that the B-51 was a good flying machine with lots of potential. Again, possible domestic and export versions(could this have become an American Canberra?). It used to be said, "the sky's the limit". Be still me beating heart. That's almost as ambitious an undertaking as a 1/72 Ark Royale or similar. And something like that would help inspire a cleaning out of a display shelf, should one have a rather large collection of Seafires in 1/72. After all, don't just dream; dream big. And a 1/72 scale carrier or battleship are big. I dare, and I like. 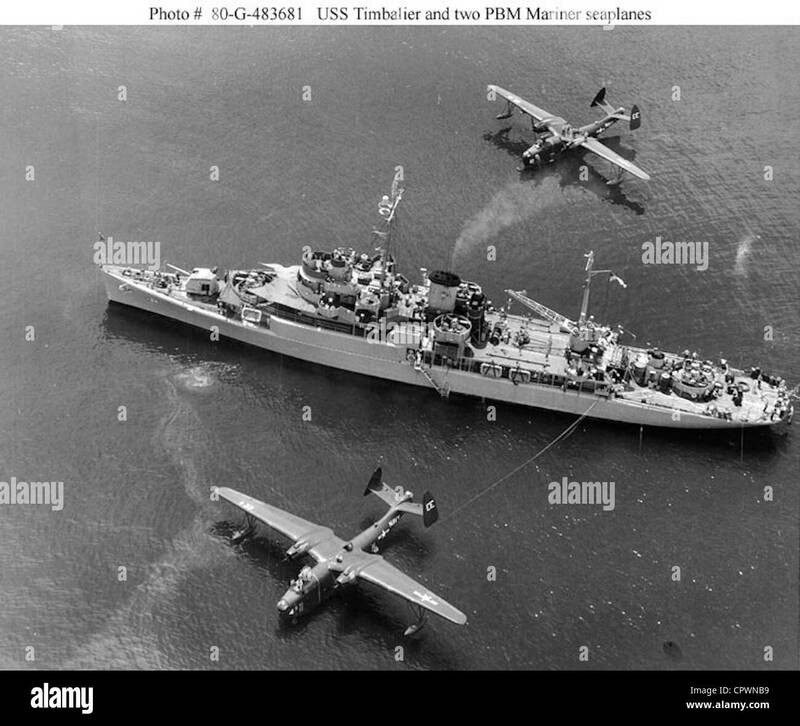 While I don't have a lot of passion for ships, they are worth looking at if only to learn something more to help with aircraft modelling. A 1/72 diorama with either an LSD, a submarine with floating barge(seaplane drydock, you could say), or even a dinghy with a couple guys, one in duty uniform, the other wearing something different, could be doable in 1/136, which would mean scratch building smaller. Well you have got this 'large' 1/72 USS Enterprise that some guy in the US built, it's complete with air wing. 16ft long, 5ft wide and 4ft high. Took the guy 19 years to build.